One of the strangest things you see in this chaotic and badly organised country must be the lines of people waiting. Even after all this time it still amazes me how people, one neatly behind the other, stand waiting in what often seem like endless lines. Never pushing, and surely no passing in front of someone else as that is considered a mortal sin. People wait in line for busses, for banks, at migraciones, at the supermarket, at the theatre when you pick up tickets already booked and paid for on the Internet, to pay your bills, at the pharmacist, at the phone company, at the post office. You name it, and there is a big line in front of you, of extremely disciplined, waiting people. Sometimes the lines are 3, 4, 5 blocks long. One wonders, does their patience has limits? Patience is something you need when you live here, and fortunately I have lots of it. Expats with no patience barely survive here and start looking for another place to live as soon as they realise there is no way to escape from it. And there isn’t. Unless you are pregnant, have a little baby on your arm, if you are disabled or not so very young anymore. Waiting in line reading a book, texting, calling, kissing, listening to music moving your feet at the rythm, or just staring at the people around you, but there is amazingly little talking. It is certainly not considered a place to get stressed. Nobody seems to care. Waiting in line is a national sport. Waiting. Waiting. Waiting. Todo tranqui. Welcome to Argentina. 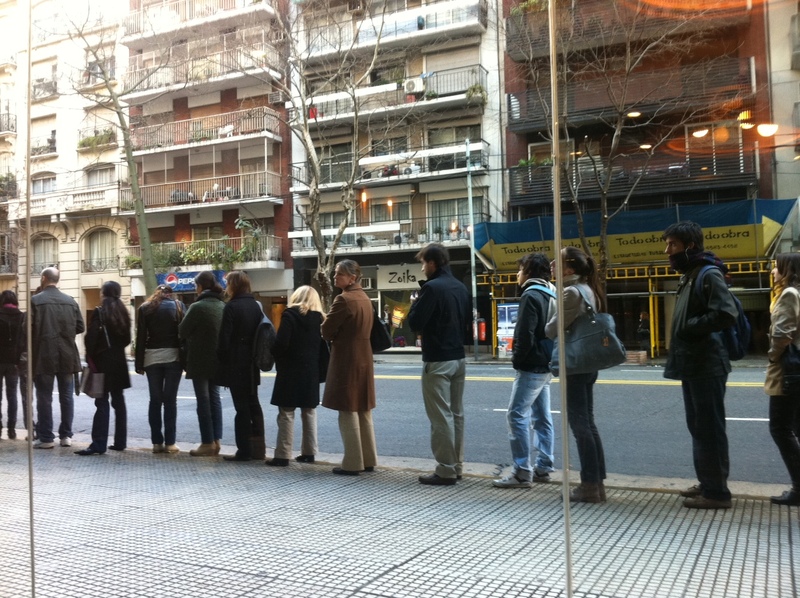 The fact that Argentineans stand in line so neatly is actually to be commended, and stands in stark contrast to the chaos elsewhere. The real problem, in some cases, is the inefficiency of the server or whatever people are standing in line for. In cases of clear, sometimes plainly non-intelligent or non-caring, inefficiency I really lose my mind (not just in Argentina…). Indeed! Like at Colon, having to wait in the same line with people still having to chose and pay for their seats, while you already paid for them and only have to pick them up…. I thought Brits were the kins of lines. Patience can sometimes be mistaken by resignation. Which doesn’t speak well about Argentines. And the order you seem to point out is not such thing. If something disrupts the queue, everybody will push and shout and so on ….. the little talking going on is very odd since most people are not friendly. 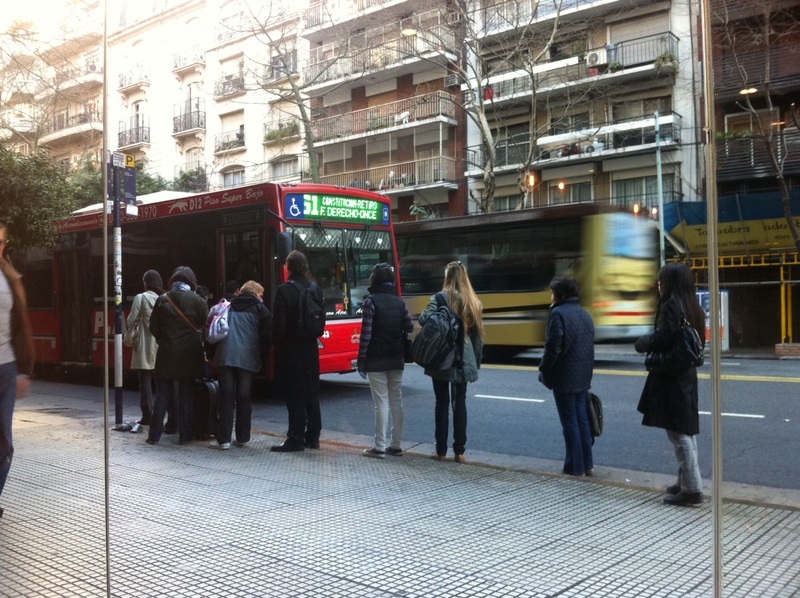 Well, some strange things happen somewhere like in the Salta street in Moron where people wait the 1 line which go to Primera Junta. You never see a queue , the people are all around , one sit in the vereda , other speaking with the kiosquero .In many years never saw a bit of a trouble , when the bus came the women first and all the men struggling to be the last. Strangely is the second stop and usualy the bus arrive half or almost full …. You should come to Greece, where lines don’t exist! Well, they probably exist, but the real greek is always trying to pass the line and try to be a ‘smart’ guy!! And of course, there is no line while waiting to go in the bus/train. The one who will puss the most, is the one who will finally go inside the bus/train!!! Still reading with big interest every post of you Katti!!! Hey people why dont you move back to the US?? why are you here if it’s so bad??? I guess you guys never been to Italy where there are lines everywhere. Last I’ve checked, they are lines in the states as well. If you dont like our country, do us a great favour, go back ! Dear Carolina, first of all I’d like to say that I am not from the US, and secondly, it is obvious you misunderstand the story. oh, poor Carolina she got this story so wrong! I love it. Carolina is not a native speaker and she misses the subtleties of the language.